A Bangladeshi student wave Bangladesh's national flag as they block a road during a student protest in Dhaka on August 4, 2018, following the deaths of two college students in a road accident . - Parts of the Bangladeshi capital ground to a halt for the seventh day running on August 4, as thousands of students staged protests calling for improvements to road safety after two teenagers were killed by a speeding bus. Student protesters have been taking to the streets in Bangladesh's capital to demand safer roads. 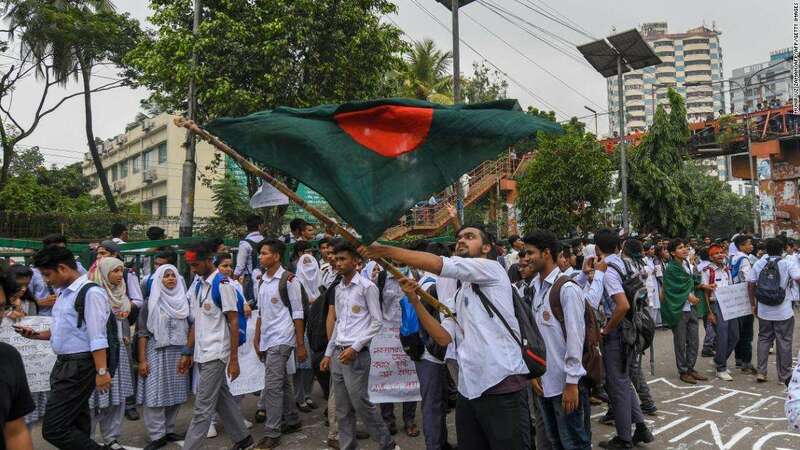 Protests broke out in Dhaka last Sunday, when two students were killed by a speeding bus, Bangladesh's state-run news agency, Bangladesh Sangbad Sangstha (BSS), reported. [post_ads]After a week of protests that saw several schools closed, government officials Saturday urged students to end their demonstrations and return to classrooms, the news agency reported. According to BSS, the country's Education Minister, Nurul Islam Nahid, told the demonstrators that their demands had been "accepted" and the government was working to bring "discipline" to the country's transport sector. The news agency reported on Wednesday that the driver of the bus allegedly involved in last weekend's crash had been arrested. Earlier this week Bangladesh's Prime Minister Sheikh Hasina met with relatives of the two students who were killed.